Alaska lost a dedicated advocate for wild Alaska last month. For the time I knew Susan Olsen, she always had a ready smile and a twinkle in her eye. 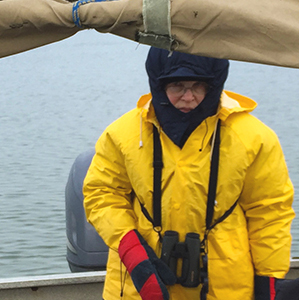 Susan bundled up when on a trip to see polar bears in 2016. Susan was a founder of the Alaska Quiet Rights Coalition, which works to maintain and restore natural sounds and natural quiet in Alaska through advocacy and education for the benefit of people and wildlife. I first met Susan as a client for public lands cases at Trustees. She was so sharp, and while she may have been sitting quietly, her mind was always busy. When she spoke, she always brought important wisdom to the discussion. Susan joined other Trustees supporters on our first trip to Kaktovik to see polar bears in 2016. After settling into the Waldo Arms Hotel, we were soon out on the water to view the bears. Though scheduled for 20 hours of bear watching over the course of four days, the forecast promised high winds on the last day. We had to get in our time before the winds, so we took longer tours—five hours instead of four. The weather was pretty good before the weather came in on Sunday, but it did get cold. We wore layer after layer after layer, and by the time we were dressed and in our boots, we had to rush outside before we overheated. Susan was a trooper and had a great time seeing the amazing bears. We had lively discussions with the guides, and we learned and laughed a lot. I feel very fortunate to have had the time with Susan and the others in an experience not many get to have. Susan was a beautiful person. Her passionate advocacy for the wild and pristine places—the quiet—will be missed by many. I feel privileged to have known her and learned from her. Trustees will continue to protect those lands and experiences Susan loved.